Vivica A. Fox Pictures Gallery, Video, Wallpaper. 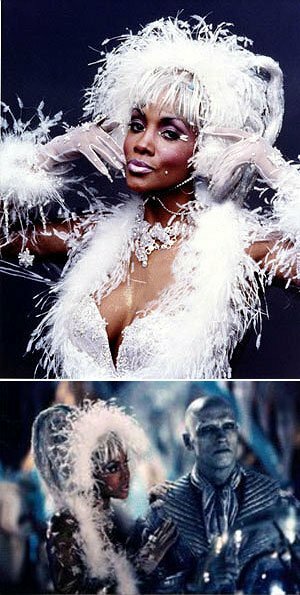 Vivica Anjanetta Fox (born July 30, 1964) is an American actress. She is best known for her roles in the films Independence Day, Set It Off, Soul Food, Why Do Fools Fall In Love and Kill Bill: Vol. 1. Her comic book hottie role was as Mr. Freeze's squeeze Ms. B. Haven in franchise killer Batman & Robin. Fox, who is of African American and Native American descent, was born in South Bend, Indiana, the daughter of Everlyena, a pharmaceutical technician, and William Fox, a private school administrator. She is a graduate of Arlington High School in Indianapolis, Indiana and Golden West College with an Associate Art degree in Social Sciences. Fox moved to California to attend Golden West College. While in California she started acting professionally, first on soap operas such as Generations, Days of our Lives and The Young and the Restless. She was cast as Emily Franklin in the pilot episode of ABC's Living Dolls a sitcom and spin-off of Who's the Boss? but was replaced with Halle Berry for the remaining episodes. Another early role saw her as Patti LaBelle's fashion designer daughter, Charisse Chamberlain, on the NBC TV series Out All Night. She also appeared as Jazz' sister on the hit show The Fresh Prince of Bel-Air and on "Beverly Hills, 90210". She got her big break in film in two 1996 movies, Independence Day and Set It Off. From 2004 to 2006 Fox starred in the drama series, Missing on the Lifetime Television Network with Caterina Scorsone and Mark Consuelos. Upon her duration on the series, she was also one of the show's co-executive producers. Fox was a judge on The WB's talent show The Starlet. Fox participated in the third season of ABC's hit television show, Dancing with the Stars, she was voted off after the fourth week. In September 2007, she appeared in the sixth season of HBO’s Curb Your Enthusiasm as a mother of a family displaced by a hurricane and taken in by Larry and Cheryl. Then, on October 1, she appeared in an episode of the show The Game. On March 2, 2010, while Fox appeared as a guest on The Wendy Williams Show, Fox announced that she would be starring in a play entitled Cheaper to Keep Her. Fox was one of TV Guide Network's red carpet correspondents for the 82nd Academy Awards which were held on Sunday, March 7, 2010.